Redwood Media Group, the nation’s leader in exhibitions and event production, media, and marketing for the global fine art community, is excited to announce a unique and newly formed partnership with Mana Wynwood, together with a permanent new home for its flagship art shows—two of the longest running independent art shows during Miami Art Week. Spectrum Miami and Red Dot Miami form the acclaimed contemporary and fine art experience that collectively presents some of today’s most coveted national and international galleries and artists from the U.S and around the world. Redwood Media Group exclusively produces the two art shows housed in one location—considered to be the only multi-show production of its kind during Miami Art Week. Red Dot Miami, a curated gallery-only contemporary art show, now in its 13th year, will be located inside Mana Wynwood. Red Dot Miami presents [ILLUMINATE] as the curatorial theme for 2018. From works that inspire awe and wonder to sweeping series that reveal new trends to artists who throw light on the roots of imagination through fearless creativity, Red Dot Miami illuminates the best the contemporary art world has to offer. This theme forms a common thread throughout the special exhibits and programming that showcases exhibitors, art industry professionals, and select nonprofits and institutions. 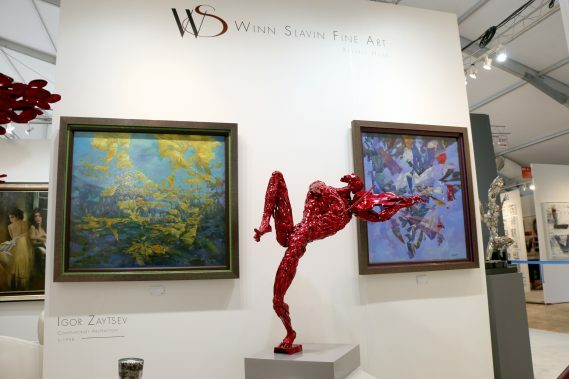 Red Dot Miami features more than 75 galleries representing over 500 leading contemporary artists from primary and secondary markets throughout the world. The five-day show attracts more than 35,000 visitors and high-net-worth collectors who interact with the specially curated programming, which includes the Spotlight Program, a focused look at several cutting-edge galleries chosen by the Redwood Media Group selection committee; Art Labs, a series of outstanding projects by leading galleries, art institutions, and art collectives within the show; and Art Talks, an inside look at the artistic experience by way of panel discussions, conversations, and provocative artistic discourse with leading artists, curators, designers, and art industry professionals. The complete Red Dot Miami program will be announced in November. Spectrum Miami, an upscale and urban curated contemporary art show, now in its 8th year, will be located adjacent to Red Dot Miami at Mana Wynwood. Spectrum Miami presents special programs and site-specific exhibitions that showcase the thriving art landscape of the city, informed by the 2018 curatorial theme [ALLURE]. Atmospheric abstracts. Provocative photographs. Seductive sculptures. The allure of contemporary and modern art is mysteriously and undeniably powerful. Spectrum Miami is where contemporary meets extraordinary, featuring the works of more than 160 exhibiting artists and galleries from the Florida region, the U.S. and around the globe. Known for its urban and upscale works of art, Spectrum Miami includes Art Labs and Art Talks as well as the Spotlight Program, providing collectors with a focused look at several prominent exhibitors, each creating a site-specific exhibition, and the LaunchPad Artist Program, showcasing an emerging and unrepresented artist who is selected to create an exhibition at the show, selected from a collaboration among local art institutions, galleries, and Spectrum Miami. Spectrum Miami will also include [FOTO SOLO], a stand-alone exhibit, introduced at Artexpo New York in 2016, that features up to 10 artists from various continents who have been chosen for their exemplary photographic fine art. The complete Spectrum Miami program will be announced in November. Spectrum Miami and Red Dot Miami have grown to become the ultimate destination for the fine art industry professional and contemporary art enthusiast who collectively seek a more accessible experience with exhibits showcasing the world’s most progressive portfolios by some of today’s elite artists, galleries, and emerging talents. With more than 35,000 attendees flocking to see the artwork of the 1,000+ artists showcased by over 200 exhibitors, these are two non-stop, not-to-be missed destination Miami Art Week shows. The annual Opening Night Preview Party for Spectrum Miami and Red Dot Miami will take place from 6 to 10 p.m. on Wednesday, Dec. 5, at Mana Wynwood, 2217 NW 5th Ave., Miami, FL 33127, and will feature innovative contemporary art together with Louis Jadot Wines, cocktails, hors d’oeuvres, and DJ entertainment. Tickets for the Opening Night Preview Party are priced at $50 by purchasing online or $60 at the event. A General Admission 1-day Pass for Spectrum Miami and Red Dot Miami is $25 by purchasing online or $30 at the event. A 5-day Pass that includes the Opening Night Preview Party is $75 by purchasing online or $85 at the event.. Tickets grant access to both Spectrum Miami and Red Dot Miami. For further information on the shows or to purchase tickets, please visit spectrum-miami.com, and reddotmiami.com. For more information on Redwood Media Group, visit redwoodmg.com.